Self-massage, also known as Abhyanga, is a traditional Indian self-care regimen. It is used to help stimulate and detoxify lymph, tone the muscles, lubricate the joints, balance the nervous system, increase circulation, improve sleep patterns and much more. 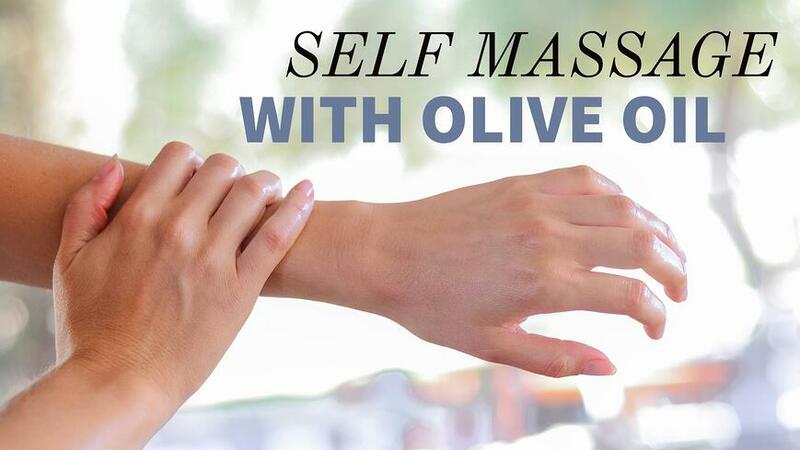 Self-massage with olive oil is something that has been practiced for centuries and is incredible for the skin. It moisturizes it while increasing its firmness - reducing wrinkles and promoting youthful skin. This treatment takes no prep time and uses an ingredient you most likely have in your kitchen. My two sisters, Mom and I have been doing this for years now and let me just tell you, it works! *We always and only recommend using Extra Virgin Olive Oil on your skin. Enjoy a slightly heated oil for you massage by placing the (glass) bottle of oil in a pot of warm water and allow it to sit there and warm up for about 5 minutes. After finishing your self-massage, feel free to wipe off any excess oil on your feet so you can safely walk about without slipping. Designate one towel to be your self massage towel, just in case you spill oil or get oil on it. Take a shower or bath before or after. We recommend after if you do the scalp massage, so you can wash the oil out of your hair with shampoo to avoid greasy hair. Sprinkle some baking soda over your drain and the floor of your shower and let it soak in for three minutes. Then pour distilled white vinegar on the shower floor, allowing it to run down to the drain after you wash the oil off your body. This will help maintain a non-slippery shower floor and clean drain and dissolve excess oil. Note: please be cautious when in the shower not to slip! Self-massage can be performed as often as possible, daily, every other day, weekly, or just as a treat! Although you will of course get the most out of it if you do it daily. What do you think? Will you give this treatment a try? Let us know in the comments below!